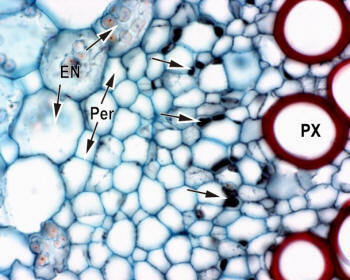 you can see details of what appears to be an endodermis (Casparian strips are visible in the detail micrograph below). A pericycle occurs beneath the endodermis. The phloem tissue is quite extensive, and comprises vascular parenchyma cells as well as sieve tube companion cell complexes. Companion cells are darkly-stained. At first glance, one would interpret this as part of a root system, but this is not the case. Nymphaea petioles contain both an endodermis-like layer (stores starch, and has Casparian strips) and an associated pericycle layer. Their function is assumed to be the same as those occurring in the root system -- regulation of centrifugal and centripetal transport across the cortex and stelar boundary. EN = endodermis; Per = pericycle; PX = protoxylem; unlabelled arrows point to companion cells.